With Instagram, Twitter and Snapchat around, we are spoiled for choice with the latest trends happening around us. Capturing your next Instagram-able moment could be crucial, so here are 5 eateries in the Petaling Jaya district to make your feed and taste buds pop. Located in the heart of SS15 Subang Jaya, Owls Espresso does not only offer coffee, but their famous bingsu as well. With over 10 different flavours to choose from, it should be a crime to resist trying some of the bingsu offered. The flavours include but not limited to, mango cheese bingsu, brownies bingsu, mocha bingsu, and cookies and cream bingsu. Owl’s Espresso also offers cotton candy bingsu! Cute cotton candy shaped animals to put a smile on your face. If bingsu isn’t your thing, they also offer coffee, meals and specialty drinks to give your taste buds an experience. A Petaling Jaya grown café that features delicious desserts and a trendy interior design to fit the astatic. The café features an array of drinks which will quench your thirst. Diners will be exposed to more than just drinks, their well-known crepes have the locals craving for more. Some of their famous and Instagram-able Crepes includes, Kayaman, Dark Side, Red Riding Hood, and Adam’s Sin. Their milkshakes definitely brings all the café hunters to their yard! An aesthetically pleasing café in Bandar Sunway, it will give your taste buds an experience while leaving your followers intrigued. Their uniquely designed milk-shakes include, Bandung Milkshake, The Cousin, The Father, The Son, and The Nephew. Garage 51 is a must try if you’re in the Petaling Jaya district! Here’s one specially for the caffeine addicts, their collection of coffee and lovely decorated interior design allows café goers to relax and unwind. Students are highly recommended to visit, their soothing choice of music mixed with the interior design and a lovely cup of coffee helps students to keep focused while completing their assignments. Their coffee art also makes for a good Instagram story update. With a well-designed background and good coffee art you could never go wrong. A feel good homely designed café with ample of natural sunlight to brighten up your next picture. 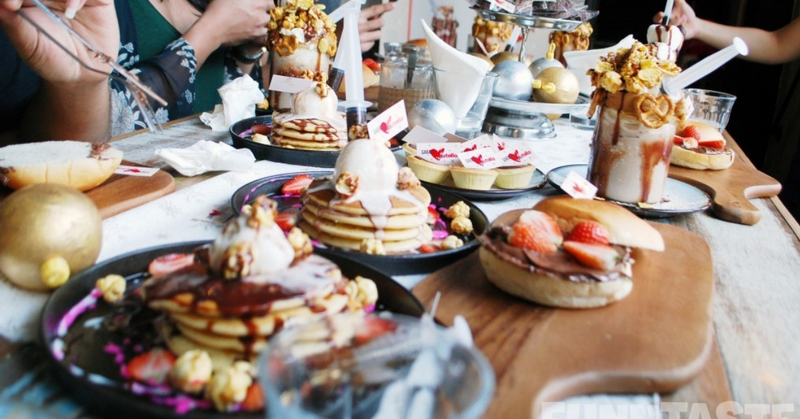 The café also offers deliciously plated pancakes to savour your taste buds. It is located within a sports centre in Petaling Jaya, with a view of the pool, while surrounded by palm trees. Let us know which are your go-to cafes down below!